Official launching : March 18, 2013 at St. Michael school. Solarsysteme's Sylvia Radisch-Siebert (white shirt) and Mandy Radisch (in blue) at St Michael school during the training on PV basics. Photos by Solarsysteme-Sachsen GmbH. 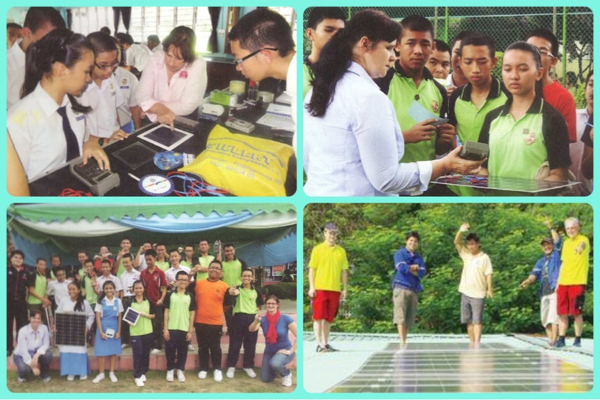 Bottom image (photo by New Sabah Times) shows St Michael students with the completed rooftop solar PV system. I really hope that the school will allow the general public to witness the launching in March 2013. I'd love to be there. If we are to fit this into the FIT scheme currently on-going in Malaysia, and assuming TNB/SESB buy the 6,800 kWh energy produced at RM1.40 per unit, this will give annual income of RM9,520 or RM793 a month. This money can be used to offset the school's monthly bill. Quite interesting. Note: Active links are shown at the end of this article. PENAMPANG: Solarsysteme Sachsen GmbH announced that it has completed the installation of a 5.4 kWp rooftop photovoltaic system at SM St Michael in Penampang, Sabah. The installation is part of the worldwide “dena Solar Roofs Programme” coordinated by the Deutsche Energie-Agentur GmbH (dena) – the German Energy Agency – and co-financed by the German Federal Ministry of Economics and Technology (BMWi) within the initiative “Renewables – Made in Germany“. Locally known as the Solar Roofs Project Malaysia, the project was initiated in October 2012 in co-operation with the SM St Michael. The school is the first in East Malaysia to be fitted with a PV system. Sabah was chosen due to the state’s great potential on the availability of solar energy. The school was chosen not only because of the many prizes they have won for implementing green projects, but also because of the school’s positive spirit and enthusiasm in advocating renewable energy. The intention of implementing this project is to further educate the students on PV’s crucial role in improving living conditions around the world, as well as displacing the use of fossil fuels to generate electricity. The “dena Solar Roofs Programme” was developed by the Deutsche Energie-Agentur GmbH (dena) – the German Energy Agency. Launched in 2004, this programme, co-financed by the Federal Ministry of Economics and Technology, supports German solar energy companies entering new markets. The PV system installed at the St. Michael Secondary School consists of 24 panels, 2 inverters and a battery system distributed over 41 square metres rooftop of the school, which has 903 students. The solar system generates approximately 6,800 kilowatt hours (kWh) of solar energy per year and helps to offset the school’s utility costs. The system includes a back-up system whereby the energy stored in the battery can be used during a power blackout. To illustrate the benefits of the rooftop solar system to members of the local community, a display panel has been installed in the centre of the school to display the actual power in kW and the accumulated generated energy (in kWh) and CO2 savings over the entire period. An official launch will take place at SM St Michael on 18th March 2013. Guests will have the opportunity to see the project and the accomplishments by the students thus far. I would like to have this on top of my house, but I guess it is still too expensive for common ppl to install one. The current cost to install a rooftop system is around RM11,000 per kWp, without battery storage. So a 4kWp solar PV system (for a medium sized house) is RM44k. Add about 30% to 35% of the total cost for battery storage. So it pays to go green!